Want to learn the piano and download free sheet music? This great app will help. etude is US$3 (introductory price) and has a selection of music for free in the in-app store. 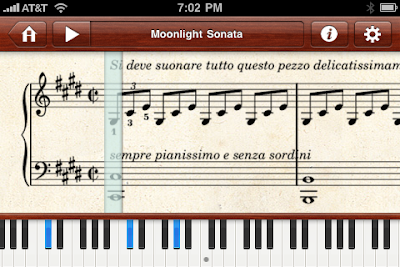 You can download sheet music like Moonlight Sonata and Fur Elise to your bookshelf. The range is limited, but the app only just came out. The same developer (Wonder Warp Software) has released Shovebox Mobile. Etude really shines when you open the score. It will play at different speeds and shows a keyboard with lit-up keys. You can move the play cursor along at your own pace and work the keys out or have the app play the music for you. The app needs better music management and a search feature and it should remember your position when you exit the app but for a beginner learning sheet music, it’s still excellent.